Attorneys for NBC News are feverishly working to get a judge to toss out a defamation lawsuit filed by George Zimmerman, claiming, oddly enough, that Mr. Zimmerman's prior work seeking to get justice for a homeless black man made him a "limited purpose" public figure. 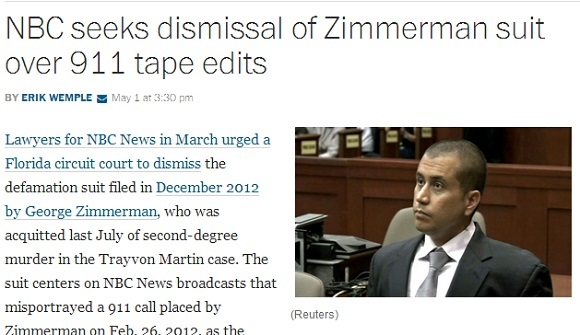 Nevermind that that's a side of Zimmerman's community involvement which the peacock network didn't really care to report as its skewed reporting suggested he was a racist. * He’s a public figure: The way NBC tells it, Zimmerman was both a “limited purpose” public figure and an “involuntary” public figure when the NBC broadcasts at issue occurred. This contention is a critical point in the litigation, because defamation law gives news organizations significant protections when covering public figures. Most commonly, those protections apply to stories of full-fledged public figures like celebrities and politicians — any complaints from such folks who hold themselves out for public scrutiny must prove that the offending news organization acted with what’s known in legal circles as “actual malice”: That is, knowledge that the allegations were false or a reckless disregard in the matter. The network’s attempt to cast Zimmerman as a limited-purpose public figure — as opposed to an anonymous guy living in some Florida neighborhood — starts “well before” any of the disputed NBC broadcasts. For instance, Zimmerman “spearheaded” opposition to the Sanford Police Department’s “perceived lethargy in investigating the relative of a law enforcement official who was allegedly involved in the beating of a black man” and pushed for the establishment of the neighborhood watch in his area — a leadership role that invites public scrutiny, argues NBC. And, after the shooting, says the NBC motion, Zimmerman’s “representatives took to the airwaves and the Internet on his behalf to disseminate to the public his views concerning whether his actions were racially motivated and otherwise appropriate,” contends the complaint. And if you don’t buy the network’s argument about Zimmerman fitting the legal definition of limited-purpose public figure, he’s at least an involuntary one: No matter his intentions, Zimmerman became “the central figure (or at least the sole surviving central figure) in what quickly became a national, and indeed international, public controversy, encompassing not only whether Zimmerman killed Martin lawfully but also the broader issues of racial profiling, vigilantism, and ‘stand your ground’ laws,” argues the NBC document. The Erik Wemple Blog Court rules that the network’s motion to dismiss (or for summary judgment) must be routed to the nearest shredder. Whatever you make of all the legalese that gets tossed around in these filings, NBC’s actions amounted to a journalistic felony that demands a full hearing in the courts.